Please note this is an older version of our 20 hour Essential English Grammar course. At the end of each part there are 20 questions which will test your knowledge of what you have learned, and examine how you would explain grammar points on specific questions. These are marked by your personal tutor and returned to you with suggested answers. The 20-hour Grammar Course was very good - it helped me to consolidate and improve my knowledge of English grammar. The study booklets were well written and covered topics in a logical sequence. The course also made good use of internet resources to supplement the study booklets. The multiple-choice questions at the end of each section meant that I didn’t have to write anything, which is quite different to other online teaching courses that I have done. My answers were returned very quickly, and I also appreciated the answer booklets that accompanied my returned work - these gave good explanations of correct and incorrect answers. In my opinion this course was very well put together and the content was excellent. The questions really tested my understanding of the course content. *If you buy your course from the Global English site direct. If you purchase via a 3rd party site, course refunds are subject to the stated terms on the 3rd party site at time of purchase. 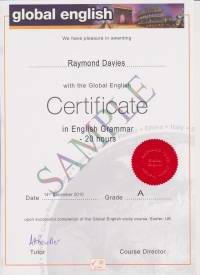 Upon successful conpletion of your course, you will receive a Global English 20 hour Certificate in English Grammar which will be emailed to you as a PDF.